She is absolutely gorgeous & I love ur blk & wht photo. Congrats on ur new puppy I'm so glad she found a loving home. Happy happy B-day & many more to come. What a precious princess. You are so lucky to have found Coco and she is so lucky to have found a good family to take care of her. Coton's are treasures. You are positively precious Coco. So happy that you have the loving home you deserve. Mommy is so right-----there is nothing like a Coton. Cherish each other and happy belated birthday to you! Hope to see more pics of you as you grow up. 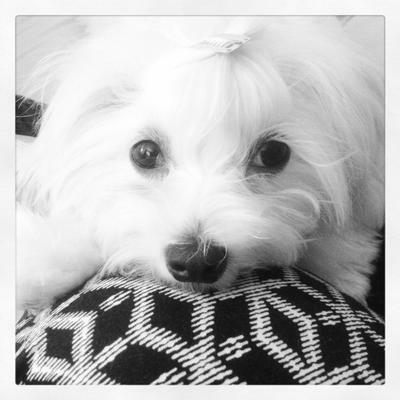 Your sweet coco looks just like my Cali-Kat ! Your story is so heartwarming...when i saw your picture, I though I was looking at my girl! She is 4 years old and weighs just over 8 lbs. i got her when she was 9 mos old. I do her hair like u do coco's. and i also give her paw-dicures ... her favorite nail polish color is burgundy! Check out our site: Jormaran's California Gurl ... I will post a couple of new pix - so u can see Coco & Cali could be twins! What a priceless face. You are both so lucky to have each other. I hate to see puppy mills popping up with these wonderful little dogs. Coco is beautiful and undoubtedly resilient. Must be that she found her forever home. This is a sad story with a very happy ending for this little girl. So glad you have her to love always and that she has you.